"Everything is nothing. The world is nothing. Everything you stand for is nothing. Don't belong. Don't exist. Don't care for anything. Don't ever love me." 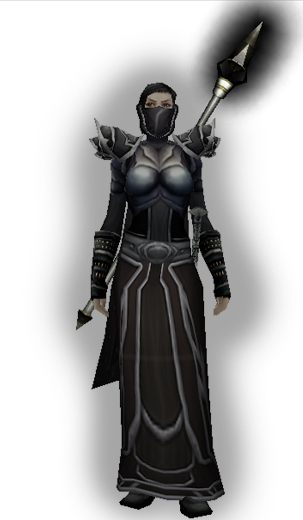 Vastania Darkheart is an accomplished nethermancer and daughter of the god Shaydis. She resides in Blackrune Keep hidden within Tir'Ein. She employs the shadar-kai and shadow elementals to do her dark bidding. She has been charged by her Mother Goddess to destroy the world and, with it, all reality. She holds a nihilistic mentality, believing life is without objective meaning or value. She holds that morality does not exist, and that any established moral values are abstractly contrived. She also likens humanoids (and all life to its full extent) to a cancer that must be eradicated. Vastania is cursed with a supernatural muteness, but is able to communicate through a type of limited telepathy. Her staff is known as the Shadowstaff and is a powerful artifact. When Shaydis was looking for a scion, She watched for a girl who was born with the longest shadow. She blessed the child with Her dark kiss and told Her shadowcults to kidnap the child and raise her in their temples. She was told she had an excellent singing voice. Taught nethermancy by her mentor and cleric of Shaydis, Kyrstan Bellenar. Came back to her family and killed her brother and her father's wife. After retrieving the Grimoire, Vastania fled westward, to Luendig. On Hope Island, Vastania read from the book as Kyrstan Bellenar performed the ritual. After only reading a few lines, an arrow from Nikki Floren and a psionic bolt from Sin severely damaged her face and caused her to tumble backwards off the cliff and into the sea. With the help of a vengeful Aasimar. While not taking part personally, Vastania sent the demon Khonnon to retrieve the Orb of Darkness from the vault of the University of Jaress. The demon was swallowed by the paladin, Meredith and the plot failed. After her mysterious source told her of the ruins on Yunis, Vastania set up shop on the moon and began to renovate the Aventi ruins for the purposes of the Shadowcults. Due to the machinations of future members of the Council of Nine (due to the behind the scenes meddling of Malareth the Ebon Watcher), she was turned to stone within the Shadow Bridge and crashed into the ruins of Calori. She is darkhaired and slim. Darkness converges on her. She has a stern face. Her mouth is covered by a muzzle. Long fingers make her insecure. She is intelligent with magic and manipulating the weak willed. Deep down she resents her gifts and hates her goddess. She also dislikes those who so easily succumb to her. She hates herself. She cares little for demons and prefers to work through her cults and shadar-kai minions. She enjoys killing and destroying sacred things, burning temples, desecrating relics and holy symbols. She is often unhappy. She used to regret everything she has done but has become numb to any remorse. She is ashamed of her lack of shame. Only in oblivion can anyone find peace. Nostalgia makes her angry. She both loves and hates her childhood memories and will seek to either destroy or protect that which reminds her. Only children receives her unconditional protection. Still even that definition is twisted. Any place in the world would still be as miserable. Any person is as useless and meaningless. To save one whom she loves - she may kill them. Ability to speak in dreams and subtly influence large amounts of people through them.